Mike Horn is a marketing strategist with extensive experience driving digital communications and e-commerce marketing strategies. 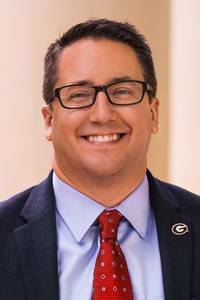 Horn currently serves as the Senior Director of Marketing and Communications at the Terry College of Business at the University of Georgia. Previously, Horn served as Director of Marketing and Digital Strategy for the University Communications department at UT Austin, where he oversaw digital content and platforms including utexas.edu, social media, and mobile apps. Under his leadership, UT Austin's social media accounts have consistently ranked among the top higher education channels in the U.S. In a 2013 ranking, the Times Higher Education ranked UT's Twitter account as the No. 1 account for social authority among all top U.S. and U.K. university Twitter accounts while UT's Klout score has jumped from 50 to 94. Prior to his higher education experience, Horn worked as a product manager at Dell, driving new products from idea conception to launch with over 50 successful global launches over the course of 11 years. In his last role, Horn developed a multi-year, multi-million dollar e-commerce, online support, and customer experience roadmap for dell.com. Horn holds an MIS degree from the University of Tulsa and an MBA from the McCombs School of Business at UT Austin.